Aloha Exchange Club member John Stewart congratulates Kevin Brodie, 'Officer of the Month' for May, and Jeremy Kubojiri, 'Officer of the Month' for June. 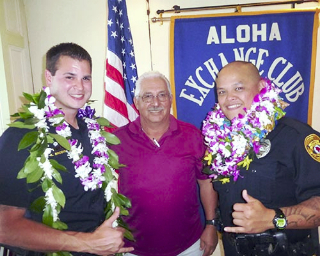 The Aloha Exchange Club of East Hawaiʻi on Thursday (June 26) recognized Officer Kevin Brodie as “Officer of the Month” for May and Officer Jeremy Kubojiri as “Officer of the Month” for June. In nomination papers, Lieutenant Melvin Yamamoto Jr. said the number of drunk driving arrests made by Kubojiri and the officers he supervised comprised 29 percent of all DUI arrests made by South Hilo Patrol for that period. “Clearly, Officer Kubojiri is imparting the importance of keeping drunk drivers off our roads to the next generation of officers,” Yamamoto wrote.